It’s 1999 and we’re in the bowels of the sweaty, smelly Half Moon Pub and there’s a half moon in the sky outside so things are aligned for a good night for the all-girl neo-punk band The G Stringz who are making their last play for fame and fortune. A rep from Diamond Records is there to see them play and possibly offer the band a record contract but they don’t know what he (or she) looks like and the nerves are beginning to show. The in your face (literally at times) band consists of bassist Lola (played by Freya Parks), drummer Kerry (Cara Baldwin – who also wrote the play) and guitarist Jill (Catherine Davies) – they are loud and brash but not the most accomplished band around. They each have their quirks with Lola the budding astronomer with astrologer undertones, Kerry (aka Ketamine Kerry) who is a drug dealer on the side and good-natured Jill who’s trying to keep everyone on an even keel which isn’t easy as they nervously search for the elusive record company rep. They all have distinct personalities: Kerry has a fierce intensity that has her crackling with kinetic energy. The doll-like figure of Lola is conflicted as she wants the band to succeed but she’s been offered places at four universities. And Jill who’s laid back with an underlying steely will to succeed. All the characters are played with broad strokes and cartoony overtones which make them fun to watch as they try and keep it all together. It’s very exuberant and moves along at punk-rock light speed but eventually takes a turn to the dark side which is like a punch to the solar-plexus and shocks the audience to the core as the laughs fade into the blackness. Cara Baldwin’s sixty-minute piece is superbly directed by Hanna Benson. It shows us how hard it is to be a woman in a man’s world which the music/record business certainly was in 1999 and probably still is now – the new millennium didn’t make much difference. 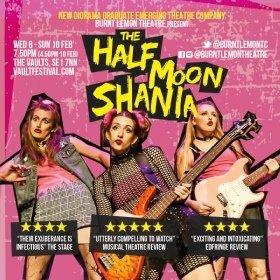 This Burnt Lemon Theatre production uses punk rock, rap, slam poetry, loop-pedal sound effects and stylised dialogue to immerse us in the world of a band trying to make it. This is a female-led company making a statement about feminism in a male-orientated world but the problems The G Stringz are having are not specific to their gender – male bands have exactly the same problems – the music business isn’t all glamour and glitz. The three performers put everything they’ve got into their roles even interacting with the audience as they arrive and handing out souvenir plectrums. There isn’t a weak link to be seen and they seem to have bonded like an actual band – arguments, clashes, camaraderie and all. At times it feels as if we’re at a real gig although if there’s one criticism it’s that the vocals weren’t loud enough in the mix when the girls were singing on stage – this is a punk band after all and they need to be ear-bleedingly LOUD! This is a superb piece of theatre and whilst it won Best Musical 2018 from Musical Theatre Review, it’s really a play with music rather than an actual musical and all the better for it. As writer and performer Baldwin says on her Twitter feed, “Makin’ ballsy theatre without the balls”. As the very much non-punk Smokey Robinson once sang “I second that emotion”. Like most of the shows at The Vault Festival, it’s only on for a few days – until February 10th – let’s hope it can have life after this run. We can’t promise your personal comfort or safety. But we can promise the prerogative to have a little fun.